We will all be meeting at New England Dogsledding located in Mason Township, Maine, at 5:30 p.m. (we will have a shuttle from Portland for those flying in/arriving by train/bus - see below). After meeting all other trip participants over dinner, the guides and Rabbi Howard Cohen will give an overview of the weekend; answer questions; review route on map and safety considerations, and issue needed gear provided by our outfitter, such as insulated winter parkas, boots, etc. Meeting lasts around one to 1.5 hours. All participants will stay at the Telmark Wilderness Lodge. About the wilderness lodge: The unique building is a one of a kind historic Adirondack Lodge, built in 1898 – 1903 by Leon Blanchard (creator of Prudential Insurance) as a wilderness retreat for his extended family, known as “Blanchmont” due to the many white birch trees that surround the estate. 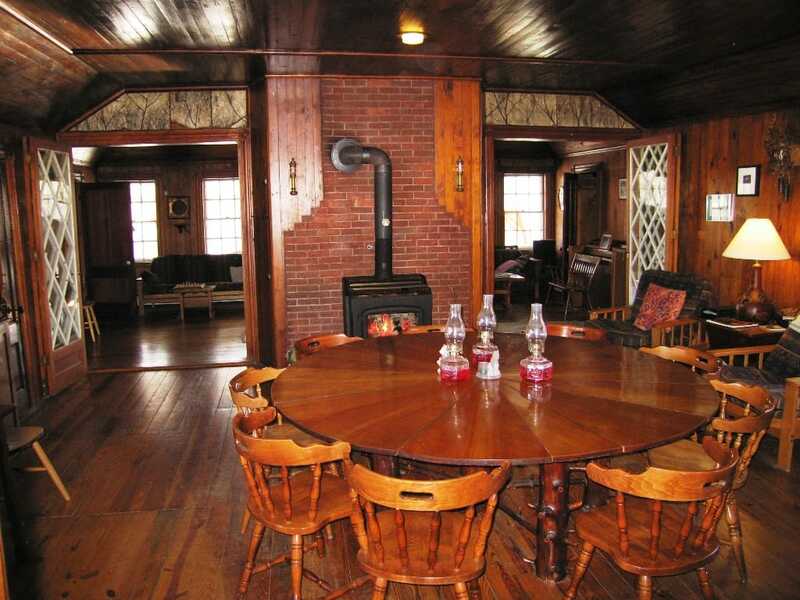 There are 5 comfortable guest rooms (double and triple), large living room and dining rooms featuring the original circular cherry dining table and large living room mineral stone fire place. The 75 foot long front porch is a wonderful place to kick back, relax and enjoy the beautiful mountainside surroundings. Dining is family-style and features tasty vegetables herbs and fruits from our organic gardens. It is also home to a kennel of very sweet, well-trained, highly socialized Alaskan racing huskies; a small herd of friendly llamas; 10 beautiful horses, and a very large community of hummingbirds who grace us by summering here each year. This is a place where adults, kids and families, for the past twenty-four years, have had healthy, fun, firsthand experiences with animals and nature. Our organic gardens which thrive on the many years of carefully prepared compost and meticulous tending, grow incredibly tasty, vibrant and healthy vegetables. The National Forest surrounds the lodge and offers exceptional views and numerous adventure possibilities. After breakfst, we will be packed and dressed, ready for the trail. 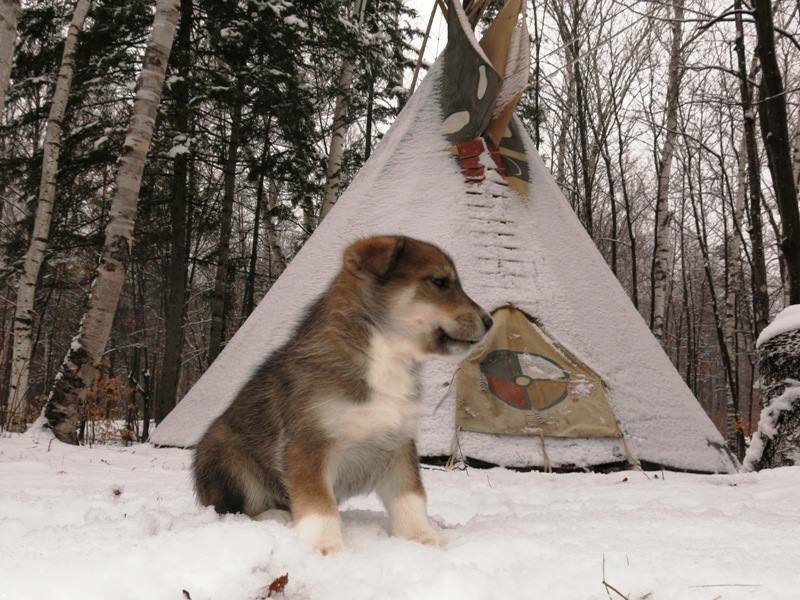 Load gear in vehicles, meet the sled dogs, and have an introductory talk about the dogs. Load the dogs into the trucks and drive to trail head. After getting a short lesson about dogsledding, we will hook the dogs up to the sled and start mushing! We will be heading today to the White Mountain National Forest, and mush on one of the many trails found there - between 8-15 miles in length depending upon current snow conditions. 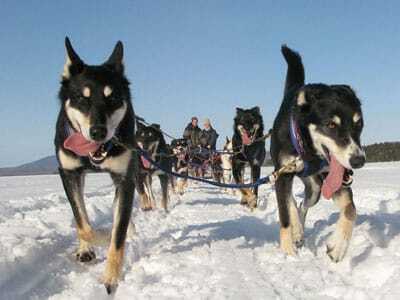 These longer runs give the dogs a chance to really stretch out and cover some ground showing you their amazing athletic abilities, while allowing you more time to get up on the "runners" with your Musher Guide and learn how to handle and drive a large team of 10-14 good looking, great moving sled dogs. A relaxed outing into beautiful mountain scenery propelled by the power of dog. This trip is for folks who want to get into the art and beauty of Dogsledding and at the same time see some spectacular North-East mountain scenery! Later, after returning to the lodge, we will enjoy a wilderness inspired kabbalat Shabbat led byRabbi Cohen, followed by Friday night dinner and activities - Shabbat Shalom! Option: post dinner night snowshoe trek! After a hearty breakfast, we will head out again for a day of mushing. Where we go depends on the weather and trail conditions. We will have a hot lunch on the trail cooked over a campfire; This is also the best day to address individual interests, such as winter ecology, tracking, or plant and tree identification! After returning to the lodge, we will enjoy a late afternoon wilderness torah study in the teepee with the Rabbi. There will also be optional snow-shoing in the area. Dinner will be followed by Havdalah, stories around the campfire, singing and music! This morning we will go out on a guided snowshoe walk in the area, and learn a bit more about the sustaible practices of our hosts at New England Sledding. Before lunch, we will de-issue gear and say good-byes to guides/trailmates. Participants are ready to go home by 2 p.m (shuttle leaves to Portland airport) or leave by car. Driving is about 6.5 hours from NYC, 3.5 hours from Boston or Montreal, 8 hours from Philadelphia, and 10 hours from DC. Participants from Philly, DC or farther should consider flying into Portland. 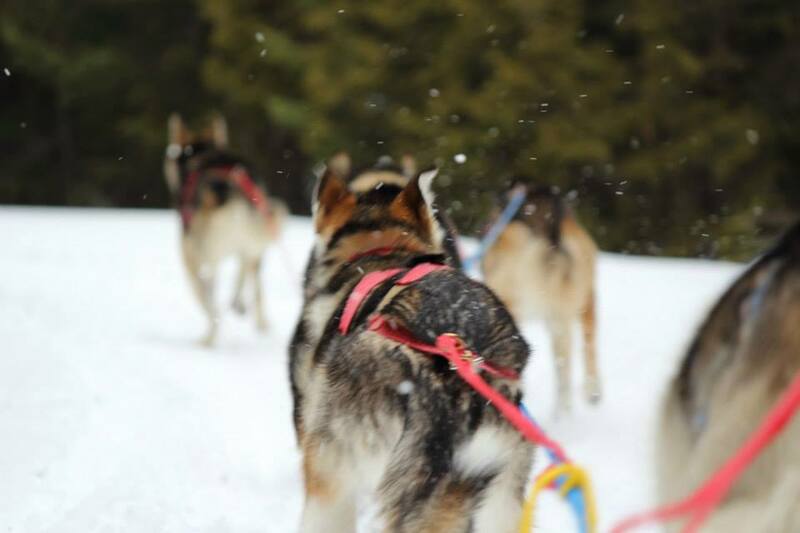 The Maine dog-sledding adventure will take place from Thursday evening, March 2 to Sunday, March 5, 2017 (3 nights in total). Our departure point will be from New England Dogsledding, located in Mason Township, ME, about 2 hours north of Portland. Participants can either drive to Mason Township, Maine on their own, or fly or take the train/bus into Portalnd, from where will be providing a shuttle to Mason Township. For those arriving taking the shuttle, we ask that you arrive in Portland by 4:30 pm on Thursday. Those arriving by car should plan on arriving in Mason Township by 7 pm. We will be ending our adventure by 2 pm on Sunday, so if you are flying or taking the bus/train from Portland, we ask that you book your trip home after 5 pm. Our wilderness guides for the weekend will invclude Steve Crone, founder and owner of New England Dogsledding (NED). Steve been working with Huskies and dogs for over twenty seven years. His passions and interests since childhood have been pursuing the “natural” and wild side of the environment– either climbing mountains in Colorado and Alaska just to “see” them or studying Alpine Ecology in graduate school out West or being attentive to the organic gardens or spending quality time with his husky pups. Steve’s professional life has always been involved with showing people the beauty of nature and teaching them how to really “get close” to the experience both for the benefit of our natural world and for the personal growth of the individual. Steve (they say) is a bit of a character, and a very talented trainer of both sled dogs and horses- llamas too. He also enjoys feeding hummingbirds out of his mouth and sometimes entertaining guests with his witty humor. New England Dogsledding is located on the Maine and New Hampshire border of the White Mountain National Forest. It is home to a racing and recreational kennel of beautiful, well cared for, very friendly and athletic Alaskan Husky Sled Dogs. Our spiritual guide for the weekend will be Rabbi Howard Cohen - the founder, spiritual leader and senior guide for Burning Bush Adventures. Howard has been guiding, climbing, hiking and paddling year round in Northern New England and the Adirondacks for 25 years. He is a certified Wilderness First Responder and a Level 1 Firefighter. He ran Outward Bound programs for troubled youth for many years before entering rabbinical school. Howard has served as the rabbi for communities from Alaska to Vermont. He also loves to garden and build canoes in his spare time. Aside from Howard Cohen, there will be a staff-person from Greener Travel that will be with the group for the duration of the trip. During the weekend we will be getting around by dogsled, snowshoes and some light hiking. Before departing, you will receive a comprehensive list of suggested things to bring on this trip. During the month of February, the average high in the places where we will be visiting is 30 f, with the low at night averaging at 2 f. It will be cold, but most importantly - there will be snow! We will be providing all meals throughout the trip - all meals will be kosher (upon request) or kosher style. For more specific info check out this trip's FAQ page.